Kristen Hogrefe served as a speaker at Alpha Omega Academy commencement ceremonies for two years before joining the staff as a language arts teacher in 2016. In addition to holding a bachelor’s degree in English, she has a few years of experience teaching at a private Christian school in Florida. A native of the Sunshine State, Hogrefe claims she has “too much sand in her shoes to want to leave.” She enjoys spending time with family, sharing coffee with friends, running, playing volleyball, kayaking, and exploring God’s creation in her free time. She’s also a member and president of Word Weavers International, an organization committed to providing a place for Christian writers to critique one another’s work. Although she’s not sure she could ever give up teaching, someday Hogrefe would like to be a full-time writer and author. She is thankful for her relationship with Christ, who has given her a passion for young adults and writing. 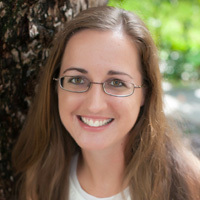 When she’s not too busy teaching, Hogrefe uses her talents to write young adult fiction, lead an online writer’s group, and maintain a blog “for young adults and the young at heart” on her website. Her favorite Bible verses are Isaiah 40:31 and 2 Timothy 1:7. Two things that people are often surprised to learn about Hogrefe are that she has a twin brother and knows how to pull her own espresso shots. She learned the latter during barista training while helping a few friends with their small business.